OKLAHOMA CITY (Feb. 10, 2017) – State Superintendent of Public Instruction Joy Hofmeister announced today that Oklahoma high schools will soon have the opportunity to offer a course designed to dramatically reduce math remediation at state colleges and universities. College Career Math Ready, a new high school-to-college transition course for the 2017-2018 school year largely composed of competencies from Algebra 1, Geometry and Algebra 2, will help students solidify foundational mathematics skills before entering college. It will not count as a math credit toward high school graduation, but students who achieve an A or B in each unit will receive a recommendation to immediately begin taking entry-level, credit-bearing classes in their first year of college. Thirty-nine percent of all first-year college students in the state wind up having to take remedial (or catch-up) courses, for which they pay tuition but receive no college credit. Oklahoma families spend $22.2 million in annual out-of-pocket costs for remediation each year. Moreover, remediation is often an indicator of potential struggles in higher education. In Oklahoma’s two-year colleges, only 9.2 percent of first-year students who enroll in remedial courses go on to graduate from that institution within three years. In Oklahoma’s four-year colleges, only 30.6 percent of freshmen who enroll in remedial courses finish their degrees within six years. 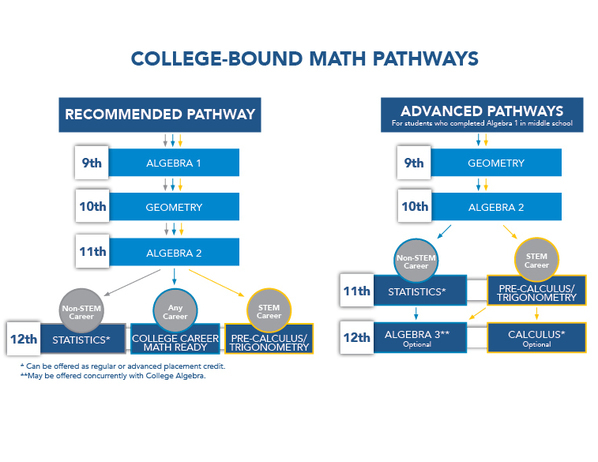 The additional high school instruction provided by College Career Math Ready will help bridge a mathematics gap for some students between secondary and postsecondary education. The course can make college more affordable by removing the significant financial barrier posed by college-level remediation. Hofmeister said College Career Math Ready addresses a prevalent need in schools across the state. College and career readiness is of particular importance in Oklahoma, where, by the year 2025, three-fourths of Oklahoma jobs will require postsecondary credentials. The formation of the College Career Math Ready course, created by the Southern Regional Education Board, is the result of a partnership among the Oklahoma State Department of Education (OSDE), the Oklahoma State Regents for Higher Education and the Oklahoma Department of Career and Technology Education. Levi Patrick, OSDE’s director of secondary mathematics, said students and their families should be looking beyond the traditional three-year math sequence of Algebra 1, Geometry and Algebra 2 to help establish a personal career pathway before college. The average ACT math score for Oklahoma students who take courses beyond Algebra 2 is 21, compared to 17 for Oklahoma students who take three high school math credits or fewer. College Career Math Ready is recommended for students with ACT math scores between 13 and 18. Also new for next school year, a course in Statistics and Probability can count toward high school graduation requirements and college admissions for students who have already completed Algebra 2. Patrick said this change offers another option for students in preparing for college, specifically those who wish to pursue a career in business or social sciences. The Statistics and Probability class will teach students to formulate meaningful research questions, design studies, collect and analyze data, and interpret the results. OSDE will offer free training for teachers this spring and summer for schools that wish to add College Career Math Ready or Statistics and Probability to their course offerings. Families interested in these classes should contact their high schools to determine availability. For more information about the College Career Math Ready course, visit http://sde.ok.gov/sde/ccmr.